I think we ended up with between 20 and 24 inches but how do you tell when the wind blows it all around, not a lot out in fields and pastures but 5 and 6 foot snow drifts in the yards. thankfully no calves born during the storm, the pairs weathered the storm behind hay racks and calf shelters that I set up before the storm. Hopefully we at done with winter now! Cover it, after I got married I moved from the farm where I grew up to where my wife grew up about 80 miles away. Backed skid steer on trailer and forgot to cover exhaust. The following year I got to put new turbo on. i guess i was referring to the no frills, gadgets easy to fix and operate, just look at how many people bought the 825 belarus 20 years ago looking for a cheap simple tractor, problem with them is they were crude russian made tractors. 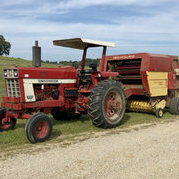 i definitely agree, all these newer tractors are nice but i cant see them lasting 50 plus years, they dont seem to make it 2 year without some sensor going haywire and having the dealer fix it because you have to hook it up to a computer first. i could see alot of 856, 1256 and 1456 getting sold if they offered them again. ive heard alot of guys say the 856 is the best tractor ever made. grandpa bought one brand new in 68, was the big horse for alot of years, its been a very dependable tractor. any pictures of the team pulling the sleigh? how can you go wrong by running the oil that the mfg recommends? yup it is more expensive to use hytran vs the cheap elephant snot from walmart but if something fails such as hyd pump, ta, pto etc are you going to wonder if it was perhaps the oils fault? i will run hytran in my stuff you can do as you wish its your machinery. is that a parachute hanging in the window? Salesman gave me a set of these to try.